You know you are not in Dublin when a lawnmower can be heard outside the bedroom window at 7:30am. Eric and I packed up, said our good-byes and jumped back into the car again for the start of our journey back north. We drove underground through tunnels below the Uetliberg and other hills for a good bit of our journey towards Basel. I have never known a country where you can spend so much time driving underneath the mountains and villages so as to get somewhere in a shorter amount of time! Our first stop was at the Roman amphitheatre in Augst, where one of Eric’s co-workers grew up. Had we known that it was the largest archeological site in Switzerland, we might have planned on actually staying and exploring it a little more. As it was, we just hopped out of the car and got a picture of the ancient ruins. 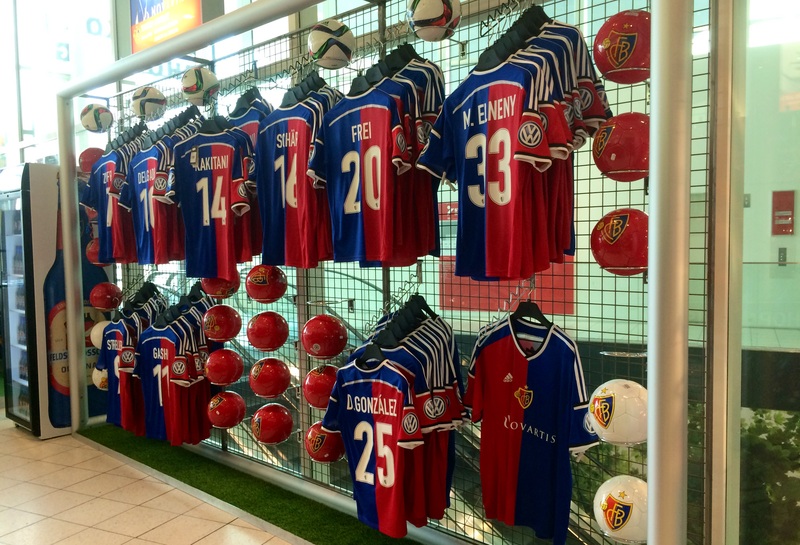 The next stop was the fan shop for FC Basel beside the St. Jakob stadium so Eric could show his support of the football club. We realized after that the halls of the shopping centre were under the stadium itself. 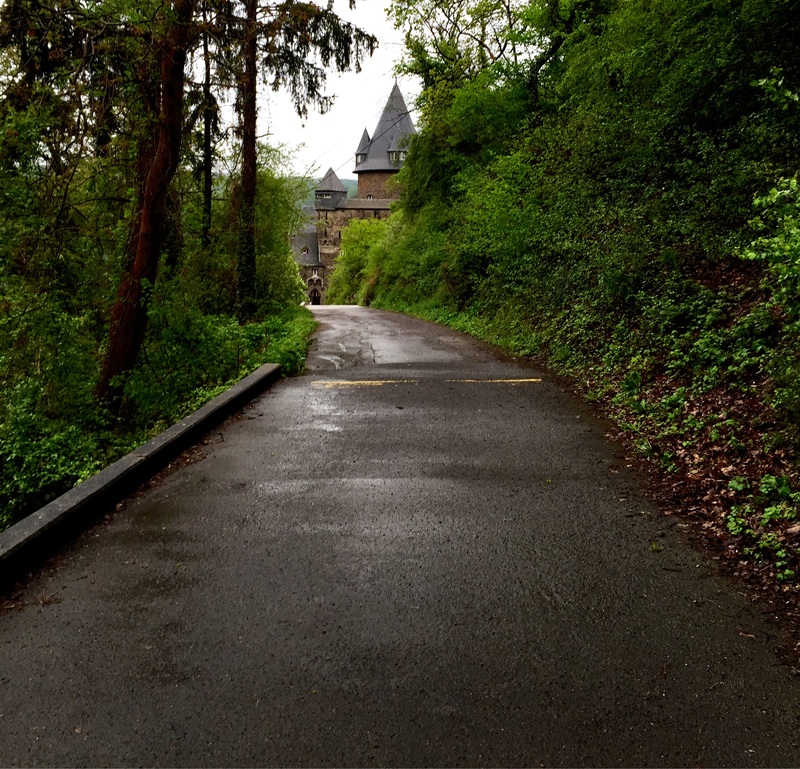 As we drove out of the car park I decided that I would be really clever and take us on a journey through the older part of the city since it is so different than Zurich. I have never driven in a city like Basel before! Trams, bicycles, poorly marked roads that twisted around like an abstract work of art. We finally found ourselves parked up on the curb of a street made very narrow by roadworks with cars coming towards us from the opposite direction. People converged onto the crosswalk that we were mostly blocking and cars piled up as they waited for them to pass. I wasn’t sure how long it would be before we could turn around without hitting anyone or anything. Finally there was a break in all the traffic so I reversed onto the footpath and began to turn around. I am sure our little episode served as great amusements to the lads standing watching it all. With the windows rolled down I shouted out the window, “Sorry!” as we reversed towards them. “No problem!” they responded. Then I had to remember to drive on the right. Lesson learned, TomTom is not always right when there are road works going on and maybe it is best to avoid driving through Basel. Thankfully, we were obviously from Ireland with our IRL plates and steering wheel on the right side of the car (literally). I think this bought us a bit of sympathy. Laughing, we eventually made our way to the German end and across the border. Soon we realized that the speed limits were gone and that going 120km per hour earned the right to drive in the slow lane, unless you were passing the multitude of semi trucks. Since my car needs to make it back to Ireland, I kept to the slow lane speeds as cars whizzed past me in the middle lane and other cars whizzed past them in the fast lane. Our lunch was an extravagant meal from McDonald’s at a truckers stop just off the motorway. As we were leaving we passed Europa Park – the huge amusement part that I’ve heard so much about. If we had realized that it would be within sight of the road we might have planned on a day there as well. We exited that particular stretch of the road at Hockenheim Ring. Apart from the spectacular forests of mixed bright and deep green trees, the scenery had been relatively unexcited until we crossed over the Rhine and turned off the main road. Small mountains rose up beside us and castles from throughout the ages began to dot the hillsides besides lush vegetation and vineyards with vines descending in perfect rows towards the river. With 14km to go to our destination we pulled over to fill up with petrol. Long gone are the two choices for fuel we have in Ireland (black handle = diesel, green handle = petrol … always!). There are four types to choose from – diesel, normal person petrol, people who wish they were race car drivers petrol and real race car drivers petrol. I looked longingly at the last two before picking up that Irish green one that reminded me that I should be thankful to just own a car. As the car was filling up I distracted myself by taking a look at the abandoned castle across the river from us. I bet there are no “do not enter” signs near it. That is an invitation to explore as far as I am concerned. 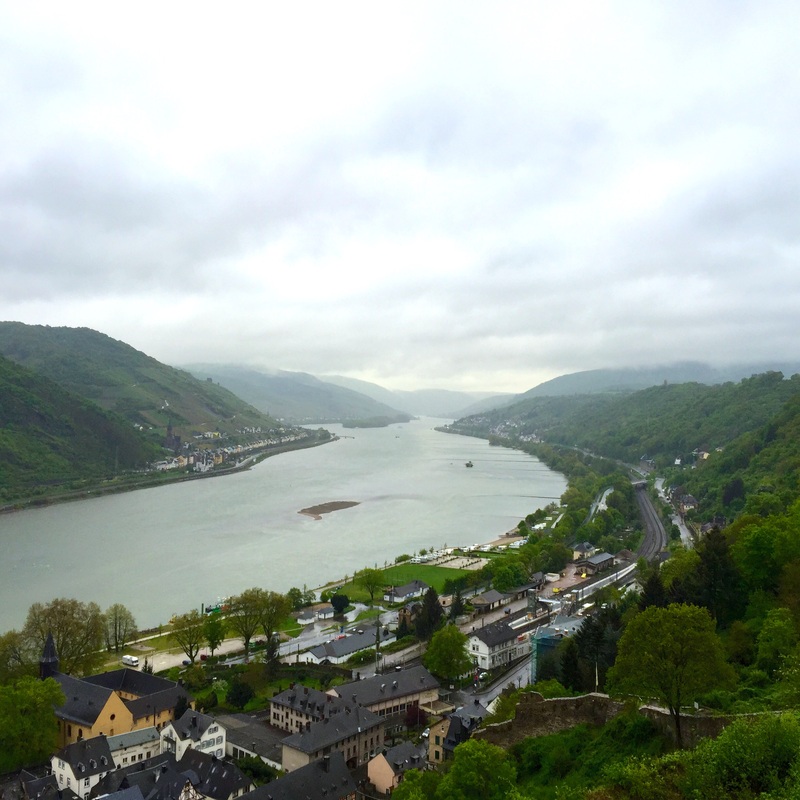 The car was finished filling and that dream came to an end as we set out north again along the Rhine. 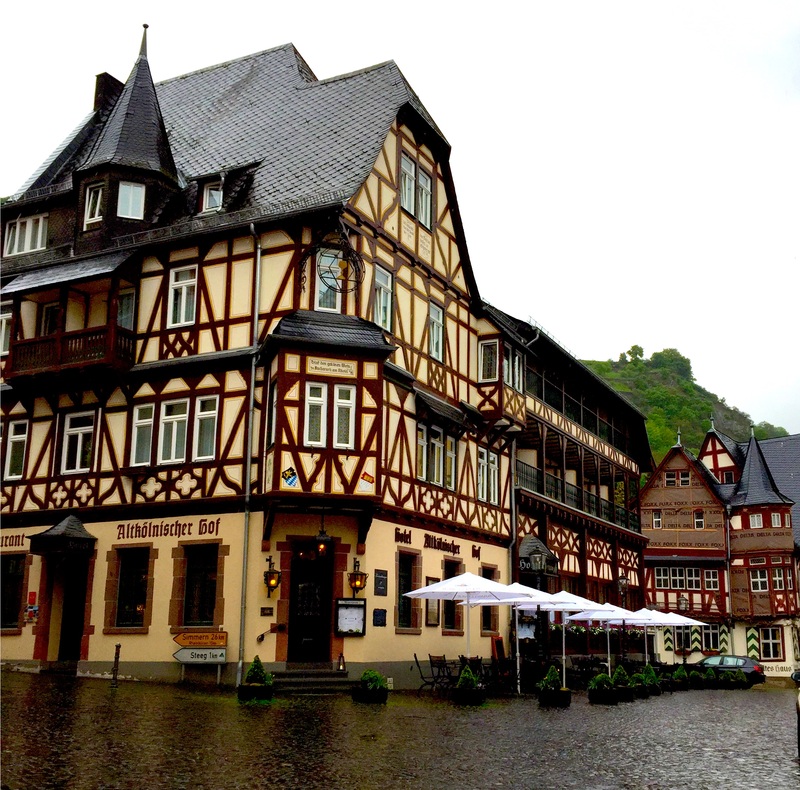 It didn’t take long before we arrived at Bacharach. I turned onto a cobbled street wide enough for one and a half cars and immediately drove under a short arch. 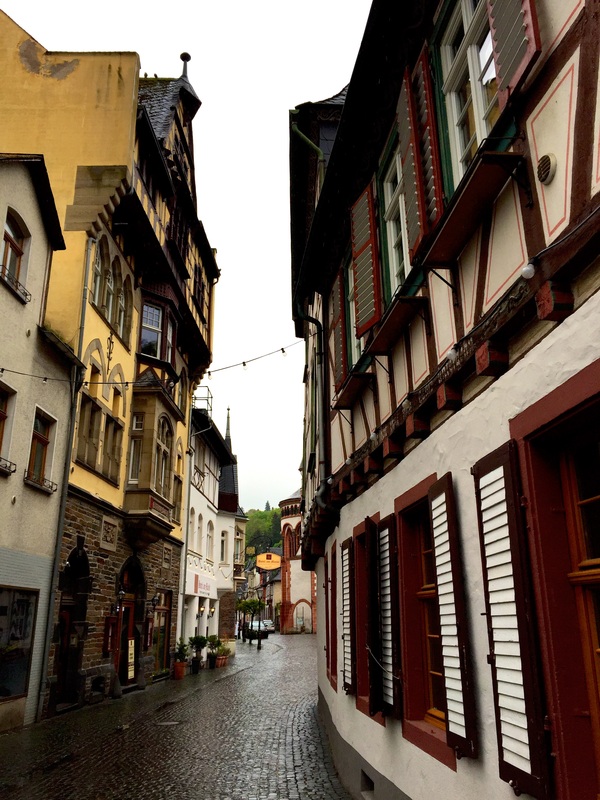 We wound our way through the old German town, hoping we were really allowed on streets like these, until we saw the signs for our accommodation. 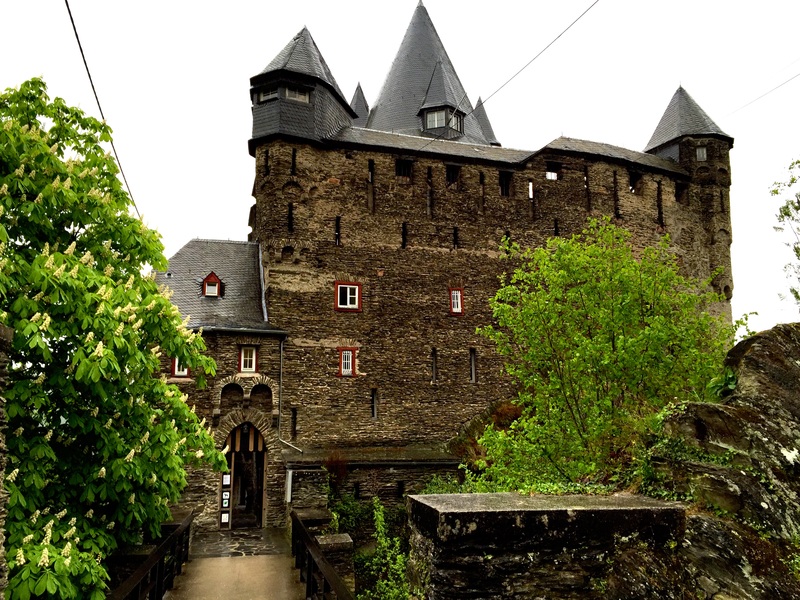 At the top of a very narrow and winding road we came to the castle we had booked into. The clouds had defended into the valley by then and rain threatened to soak us if we stayed out too long. As we crossed though the main gates into the courtyard we had to do a turn about to find the entrance we were supposed to find the reception in. We were greeted warmly by the staff and were given the key to the room. Yes, this hostel will do!! It is a hive of activity and noise with school children here on educational adventures. One of their teachers who is on the same floor as us already apologized for the noise the children might make tonight. I have been in her shoes before, plenty of times! For a night in a castle along the Rhine I will welcome the sound of joy filled children all night long. The rain continued so we opted for doing a bit of exploring by car rather than on foot. We took a detour with no destination in mind and found ourselves making some very tight turns on narrow roads that led us beside vineyard after vineyard. Once we reach the crest of the mountain the road wound us back down to the main road where we parked in the public parking just outside of Bacharach, in hopes of finding somewhere to eat. After checking out the menus of a good few places we were approached by one of the staff of Altkölnischen Hof Restaurant. She explained to us some of the menu and what was on the menu for the day. Ready to get warm again, we climbed the stairs and were ushered into a small restaurant with dark wood paneling and stained glass windows. Our hostess was eager to please us and explained to me the best white wine they had that is local to the region – crisp and fruity, very fresh: Ratzenberger 2011 Bacharacher Postern Riesling Spätlese. The creamed white asparagus soup was perfect to start warming us up from the coldest day we had so far. The presentation of each course was beautiful in colour and detail. 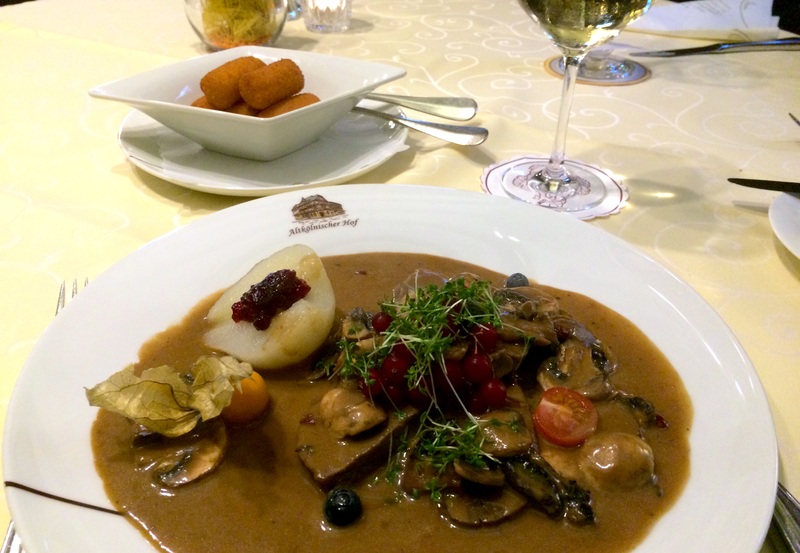 The flavours were well combined and the venison perfectly tender. By the time dessert was over an hour and a half later, I felt fully satisfied and warmed to the bone from the food and the welcoming atmosphere. 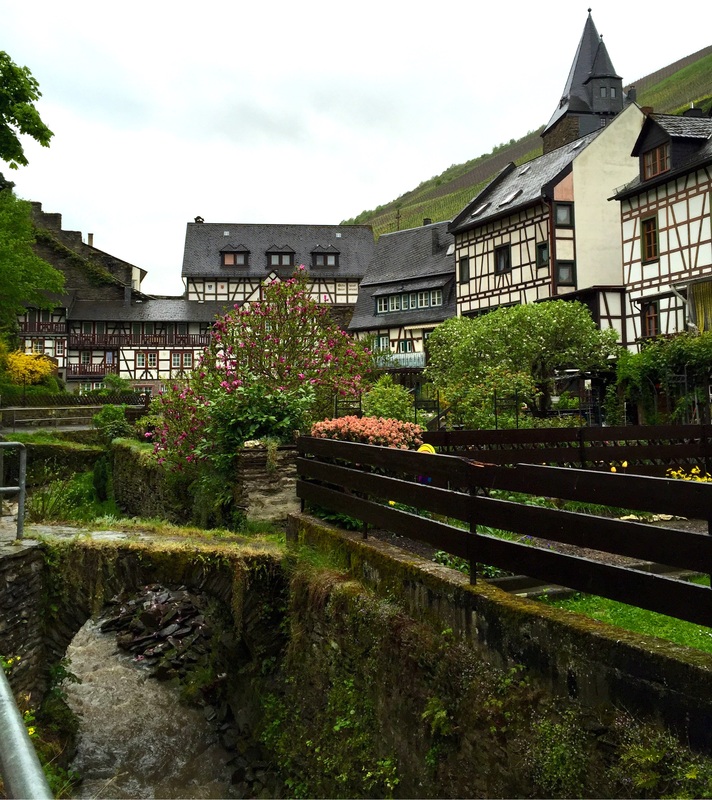 Bucharach is so much more than I could have imagined. If anyone is looking for a village that makes you feel like you have disappeared in the world for a few moments this is it , particularly during the off-season on a weeknight. 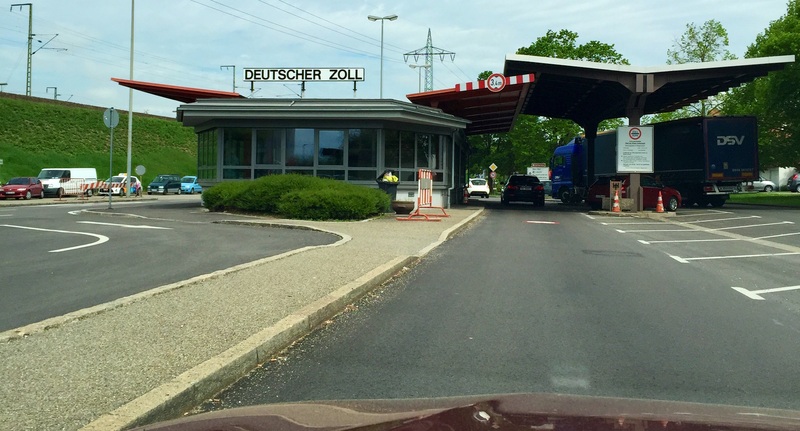 This entry was posted in BRING A PASSPORT and tagged Bacharach, Basel, castle, Germany, travel. Bookmark the permalink.